Data center efficiency matters because the future of our planet depends on advances in sustainability. But boosting data center efficiency also matters on the bottom line. For example, in a side-by-side comparison of a modular data center and a traditional raised-floor data center, an independent analysis found that the modular data center was 19% more efficient – efficiency that translated into annual savings of $200,000 per megawatt of average IT power for customers deployed in modules. Demand a standardized, fit-for-purpose, just-in-time data center – In contrast to the typical containerized data center, which is literally an old shipping container, a true modular data center is manufactured in a factory under Design for Assembly lean manufacturing methods (this video explains). 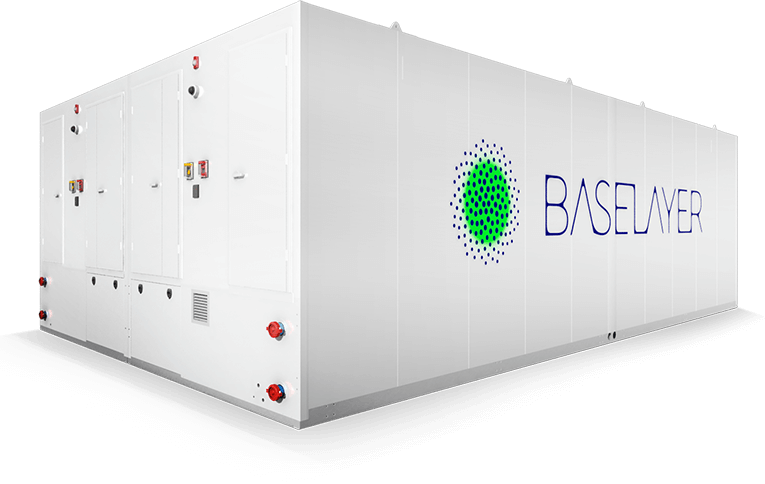 Modular data centers can and should be purpose-built to deliver standard and secure increments of power, cooling, and IT capacity wherever it is required on a just-in-time basis. Factory built also means standardized along with all of the associated benefits. When standardized, modules can be compared to each other “apples to apples.” Then you can more easily model the system, and isolate the impact of changes to the environment or workload density on data center performance. You give your engineers and operations team the data to continuously improve the data center for optimal performance under different circumstances. Measure data center performance – and everything else – Comparing the performance of data center modules under different circumstances requires, of course, the ability to measure what’s going on in the data center – from the chiller to the chip. For example, each BASELAYER data center module is outfitted with 700-1,000 sensors. Those sensors, combined with a data center infrastructure management (DCIM) system, generate a wealth of information about how each data center operates. Across the 2.68+ million operating hours that our modules have logged (that’s over 300 years), we have 73+ billion rows of data center operations data. This data allows each new module we build to “stand on the shoulders” of those that came before it. Never stop innovating – That data must be analyzed for it to yield actionable insight. For example, we use data mining, predictive modeling, machine learning, and simulation to enable our colleagues at the BASELAYER factory to take innovation insights from the field and engineer them into the next generation of modules. Push capacity limits – In addition to enabling continuous innovation, actionable insight also enables you to optimize your data center performance. That means, in part, optimizing capacity utilization. At a conference last year a colleague of mine shared this analogy: Imagine you’re celebrating a friend’s 50th birthday. He tells you that he’s going out to buy a whole new wardrobe in size 40, because even though he currently wears a size 32, he figures he might put on some weight now that he’s over the hill, and wants to be prepared. So he buys the whole new wardrobe, and every time you see him he’s struggling to keep his pants up. Consider the parallel: If you’ve over-provisioned your data center because you’re afraid that you might someday hit a capacity limit and not be able to respond in time, then you’re underutilizing your capacity today. And that’s incredibly inefficient. After all, energy overhead is fairly fixed, so if you can produce more useful work, you can get a thinner spreading of energy overhead. Higher utilization equals greater energy efficiency. Many organizations today don’t push the limits of capacity – in part because their data centers are designed for worst-case scenarios, and in part because they lack visibility into their data center operations. A modular data center pre-integrated with DCIM can solve both problems. The DCIM provides visibility into how much of your current capacity you are actually using, and analytic models provide decision-making support. For example, you could create an alert for when capacity reaches a certain threshold, so you know it’s time to boost capacity. When it is that time, boosting capacity is quick and easy to do with a modular data center. For example, BASELAYER modules can be deployed within 120 days. Operate the data center in alignment with application demand – Some applications require higher levels of power and cooling resiliency; some require less. Delivering power and cooling to meet the needs of the most demanding application is inefficient because it’s overkill for all the other applications. It would be like all of us commuting to work in armored tanks. But a modular data center pre-integrated with a DCIM gives you the rack-level visibility necessary to make application-tailored and rack-level decisions about power and cooling. To recap – data center efficiency matters. With a modular data center pre-integrated with DCIM, data center efficiency can be achieved when: the data center is fit-for-purpose, just-in-time; performance is measured; innovation is continuous; capacity is fully utilized; and the data center is operated in alignment with application demand.